Another exciting one today. Craigellachie has been building steam recently, in terms of support, good reviews, hype and, of course, a certain award. That award was World’s Best Single Malt at the World Whisky Awards. As far as I know, it would have been a panel of judges tasting all the whiskies blind, so it’s better than certain people just declaring a whisky their favourite and everyone following suit and buying it. Recently I got the chance to try both the 23 and 31. These weren’t compared together though. 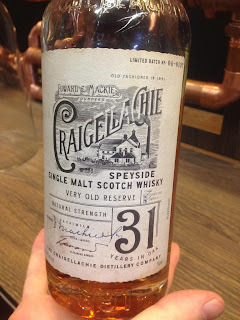 The 23 I tried at Whisky Live Paris and the 31 I tried at The Whisky Exchange Show in London. The guy on the stand really didn’t want to give me any of the 31 because they’d already broken into their reserves for the next day, so many thanks for that one! Nose: Classy with malt, sharp wood, honey, beeswax, old wooden shed complete with rusty tools. Taste: Silky soft, honey and beeswax, some rubber, then lovely malty chocolate develops, vanilla, heather. Finish: Medium/Long length. Heath-y, honeyed, and this very lovely malty chocolate. A little sharp on the nose. Unbalanced in places but nice flavours. Nose: Pastry comes first then you smell the good sulphur, complex chocolate, heather and honey, orange chocolate. Taste: Spicy and sweet, builds this lovely complex malt and orange, herbal, heather, honey, great dark tea, jasmine tea too. Very complex. Finish: Short/Medium length. Chocolatey but leaves quickly. One for chocolate lovers. Arrival and development are fantastic but the finish lets it down. Would have been high 80's otherwise.